A nearly five decades-old nonprofit art institution in Boyle Heights is on the verge of being a first-time property owner, thanks in part to funds secured by Los Angeles Councilman Jose Huizar (CD-14). On Tuesday, the Los Angeles City Council approved a request from Huizar to allocate $825,000 in CRA-LA excess bond proceeds to help Self Help Graphics and Art complete the purchase of the city-owned property it currently rents on East First Street in Boyle Heights. 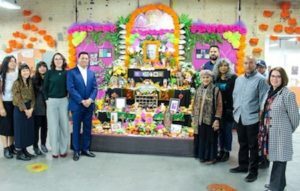 “Established in 1970, when Chicano Art and culture was often marginalized, Self Help fought the good fight and has become one of the most influential arts organizations in the City of LA and US,” Huizar said. He added that the funding comes with a commitment from Self Help to continue to offer art services and programming to the local community. “Very few community driven spaces like Self Help Graphics survive four decades,” the organization said Tuesday in an “Open Letter to the Community. “Community based cultural centers like Self Help Graphics are community pillars that reflect the existing community and provide a space for creative growth, gathering, incubation and training. Today marks a milestone in Self Help Graphic & Art’s history,” the letter states. Self Help had secured $2.8 million in grants and loans for the purchase of the property appraised at $3.625 million. The money from the city will fill the funding gap. The City Council is scheduled to vote Friday to approve the sale of the property. From local parks and recreation centers, to cemeteries, art galleries and farmers’ markets -the week ahead will be packed with family-friendly, culturally enlightening and yummy events for Halloween trick-or-treaters and Dia de los Muertos celebrants . 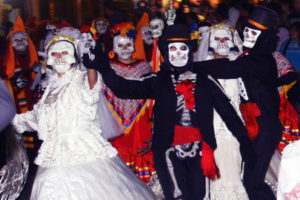 7pm–Free Dia de los Muertos/Day of the Dead Novenario & Festival Continues at Olvera St. in downtown LA. Event features processions in traditional day of the dead dress, blessings, music, face painting, colorful public altars, dance & great food. Presented by the Olvera Street Merchants Assoc, & El Pueblo de Los Angeles. Day time & evening events. For more information & a schedule, visit www.olveraevents.com. 10am-1pm–Open House to Review Boyle Heights Community Plan Update-Meeting will showcase the draft plan update and proposed zoning. Location: Boyle Heights City Hall-1st Fl. Meeting Rm, 2130 E, 1st St., LA 90033. For more info, visit www.bhplan.org. Noon-4pm–Mourning Tours at Heritage Square Museum in Northeast L.A. Repeats Oct.29. Learn all about death& etiquette during the Victorian era, the movement of Spiritualism &how other cultures remember their loved ones. Tickets are $20 for adults/$15 seniors over 65/$8 children 8-13. For more info, visit www.heritagemuseum.org. 4-8pm–Celebrate Halloween with viewing of “Alice in Wonderland” at the Downey Youth and Recreation Center in Lincoln Heights: 1772 N. Spring St, LA 90031. Mummy cookie eating & costume contests. Movie starts at 6pm. For more info, call (323) 225-7100. 6-11pm– Calavera LGBTQ Community Celebration in Boyle Heights. “Día de Los Muertos” Remembrance of Victims of Homophobia and Transphobia brings together allies and LGBTQ community members. Event includes free “Calavera” face-painting, crafts by local artisans, a DJ and dance floor along with typical foods and drinks. Location: Mi Centro, 553 S. Clarence St., in Boyle Heights. For individual or group tickets see the events page at www.LatinoEqualityAlliance.org, email info@latinoequalityalliance.org or call (323) 286-7224. 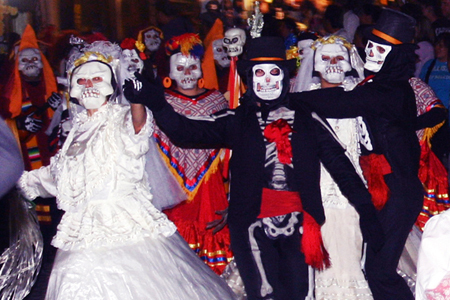 10am-7pm–“Fiesta Muertos Weekend Festival” Presented by the Olvera Street Merchants Assoc. Foundation & El Pueblo Historical Monument. Event features live cultural entertainment, theater, community altars & face painting throughout the day. or more information & a schedule, visit www.olveraevents.com. 12pm-12am –Ford Invites You to Share Your Love of the City at the Dia de Los Muertos event at Forever Hollywood Cemetery. The popular Dia de los Muertos event is one of the largest, most vibrant and colorful Day of the Dead events in Southern California. Take a look at the new Ford vehicles, enjoy Day of the Dead activities, altars, music, food & much more. Time: 12pm to 12am. Forever Hollywood Cemetery is located at 6000 Santa Monica Blvd., LA 90038. 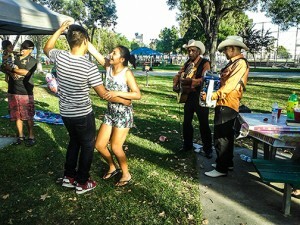 12-3pm–Boyle Heights Harvest Festival at Pecan Park: 145 Pecan St., LA 90033. Free face painting, pony rides, resource booths& pumpkin giveaway. Call (23) 262-2736. 3:30-5:30pm–Zombie Run-Run for your Mummy at Veterans Park in Bell Gardens. A Game Room favorite is back with twists, turns, and more zombies! Join the fun. Ages: 5-14. Free Admission. Game Room is located at 6662 Loveland St. Bell Gardens 90201. For more info, visit http://www.bgrecreation.org/ . 3-8pm–Haunted Harvest Festival at the Old L.A. Farmers Market in Highland Park. Costume parade at 5pm. More family-friendly activities. Location: N. Figueroa and Avenue 58. For more info, call (323) 449-4100. 4-8pm–Halloween Party 2017 at Ramona Hall in Highland Park. Free Spooky Theater, food, costume parade and arts & crafts. Ramona Hall is located at 4580 N. Figueroa St., LA 90065. For more info, call (323) 276-3021. 6pm–Halloween & Costume Contest at all City of Commerce parks. No charge to take part. Events feature contests for best Decorated Pumpkin & Best Pet Costume. Lots of fun games. For more info, call (323) 887-4434. 6-8pm–Boyle Heights Scary Hall. Trick –or-treat with the family at Boyle Heights City Hall: 2130 E. First St., LA 90033. Talent comes in many forms. It can be found in the young and the old and blossoms most when encouraged and celebrated. That was the goal of the annual Boyle Heights Youth Talent Show held last week at Self Help Graphics and Art, a program designed to showcase the talents of some of the youngest members of the community. The talent show was sponsored by the Boyle Heights for Youth Campaign, an effort launched in 2014 by 15 community organizations and over 200 youth to advocate for a meaningful investment of public funds and resources to help the city’s most vulnerable youth. 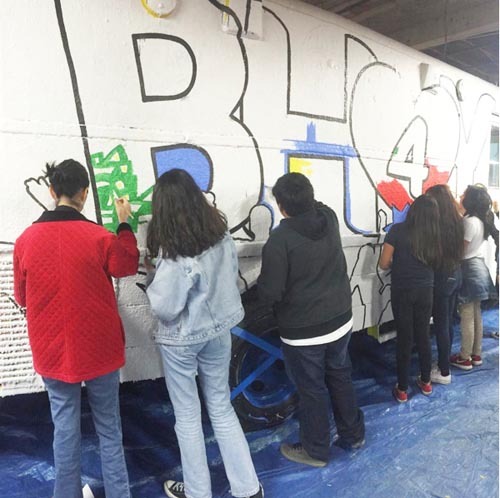 The campaign aims to create safer neighborhoods where young people have access to opportunities and resources to help them thrive and prepare for a successful future, the group said in a statement. “The youth of Los Angeles have many different skills and unique talents, this talent show lets them show everyone what they really are passionate about,” said Lou Calanche, executive director and Founder of Legacy LA. Held on Feb. 3, the mid-week event drew 250 youths, parents, and residents. Participants displayed work executed in a variety of mediums, including photography, video, music, dance, poetry, spoken word, and 2D/3D graphic design. The talent show is only held once a year, but Calanche said she hopes it has a lasting effect on all who took part, as artists, demonstrators or as observers. Norma Galeas is a senior in high school and lives in the Ramona Gardens housing community. She says she’s been involved in youth development programs since she was in middle school and credits those programs for who she is today. According to Galeas, programs such as this encouraged her to contribute to her community. Today, “I am a leader in this campaign because I feel strongly that all of you in Boyle Heights, and the city of Los Angeles, deserve to have access to youth development programs to help them better their futures,” Galeas said. “Giving these future leaders an outlet for creativity and exploring their interest gives youth a leg up in being successful in life and being better prepared for the future where they can fine tune and hone in on their strengths,” Calanche emphasized. ¿Qué significa el hogar para ti? Las Fotos Project preguntó a más de 100 adolescentes de Westlake, Huntington Park, Koreatown, Highland Park, Boyle Heights, South Central LA, y Tijuana y ellas respondieron a esta pregunta utilizando sus cámaras digitales. Las imágenes muestran sentimientos de comodidad, seguridad y pertenencia, y abordan temas sociales como la gentrificación, desplazamiento, y la inmigración. Se invita a la comunidad a ver sus fotos y leer sus escritos documentados. La recepción de apertura de esta exposición fotográfica tendrá lugar el Sábado, 12 de diciembre de 5 a 7pm en Self Help Graphics & Art, 1300 E. First Street Los Ángeles, CA 90033.